Current: Ace Combat 7 PSVR Impressions – Another Essential PSVR Offering? Ace Combat 7 PSVR Impressions – Another Essential PSVR Offering? 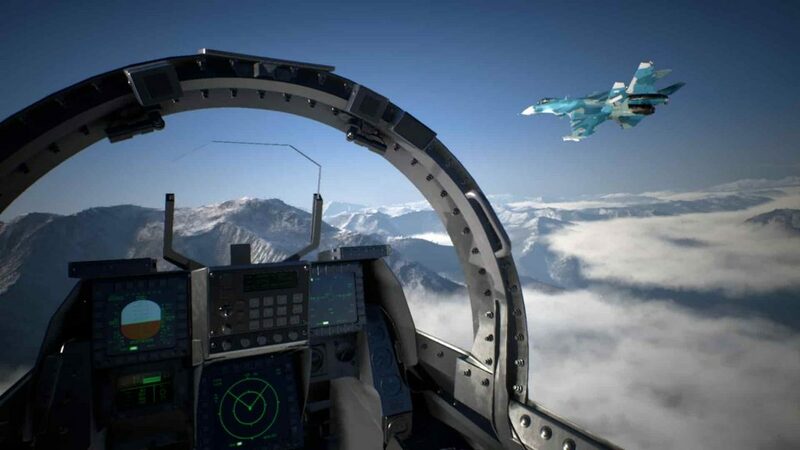 In retrospect, the Ace Combat series always seemed like a snug fit for PSVR, and so it is gratifying at last to see Bandai Namco finally take the plunge with its long-running aircraft combat franchise into VR flavoured waters with Ace Combat 7: Skies Unknown. You can read our full Ace Combat 7: Skies Unknown review, here. Perhaps the most important thing to make clear right from the start is that the PSVR portion of Ace Combat 7 is just that – a portion. Content-wise, it is a far cry from the full fat, maximum sugar single-player campaign seen elsewhere in the game, as the Ace Combat 7 VR missions number just three and don’t take very long to complete at all. Additionally, there are no cut-scenes or shift in perspective; instead the story for this mini-campaign is conveyed through voice over briefings and radio communications when you’re mid-flight. It’s hardly eye-opening stuff, but it’s fit for purpose all the same. The developers have absolutely nailed the feeling of flight with these VR missions. In spite of the VR missions curtailed length, it does actually hold a fairly solid place in Ace Combat lore, taking place some five years before the events chronicled in the main single-player campaign. Furthermore, franchise fans will be delighted to pick up on a multitude of Easter eggs and callbacks to previous games in the series that are strewn through this mini-campaign, making the VR missions section of Ace Combat 7 more intriguing to long tenured franchise veterans than it might have been before. As to the experience itself, development team Project Aces have labored some real magic here. Viewed entirely from the first-person, and controlled exclusively by the trusty DualShock 4 controller, these missions absolutely deliver on the heady promise of what Ace Combat should look and feel like in VR. 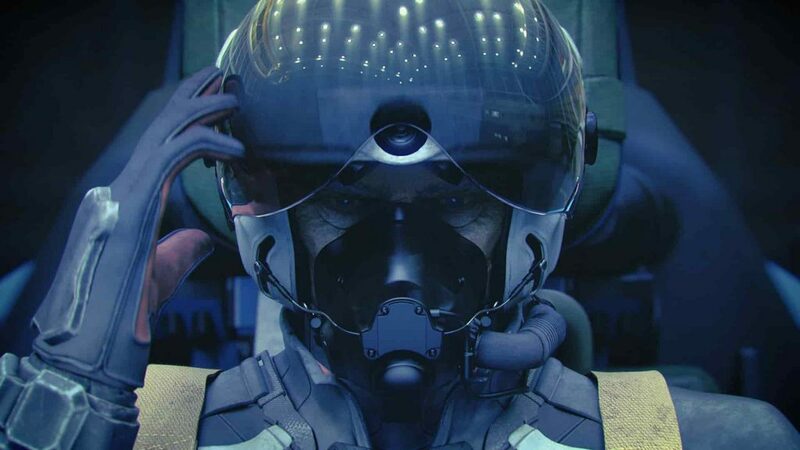 Indeed, the crux of what makes the PSVR portion of Ace Combat 7 so enjoyable, are the substantial steps that have been taken in fashioning a truly immersive VR experience. Even before you strap in and soar into the sky alongside your peers, you are given the opportunity to inspect your craft and the surrounding hangar, allowing you to soak in the painstaking detail that has been poured into every aspect of its creation. 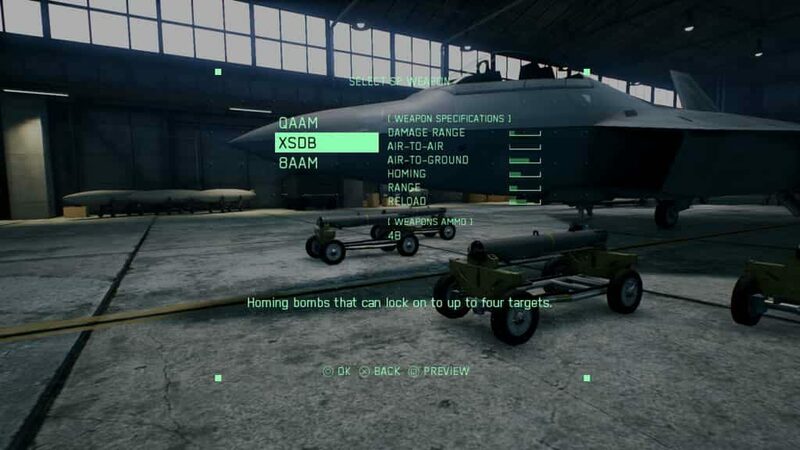 Like the main campaign, players can choose from a variety of ordnance for their aircraft. Each sortie begins with cinematic sweep and spectacle that really gets you into the mood.The second mission in particular kicks off in eye-opening fashion, as you scramble to take off from an air base under attack, while enemy aircraft dogfight and explode, all the while the pitter-patter of gunfire lands all around. It’s also before you take off that you notice that the cockpit of each craft you pilot is ridiculously detailed – everything in there just looks authentic and tangible with a proper sense of texture and depth. From the on-screen ordnance layout to the numerous switches, knobs and thrusters, everything just looks super solid. Of course, it’s when you’re soaring high among the clouds that the furiously beating heart of Ace Combat 7’s VR missions reveals itself in the most blatant way – flying planes in PSVR is simply breathtaking fun, and quite likely the closest many of us will ever get to the real thing. Indeed, if anything it provides a kind of reverse-placebo effect to the brain; tricking you into thinking that you’re actually soaring thousands of feet in the sky at great speed (don’t worry, the motion sickness is pretty much non-existent). Embracing the ‘expert’ control layout seen in the main game, players can control their craft using the DualShock 4 controller while PSVR’s head tracking functionality is used to look all around the cockpit and track enemy craft, incoming missiles and so on. The feeling of chasing an enemy aircraft, strafing them with cannon fire before letting off a pair of missiles and twisting your head around to follow your quarry is a tremendous experience – and one which sits up there with PSVR’s best. Whether you’re soaring through the clouds, skimming the patchwork countryside at breakneck speed or dodging through a barrage of incoming fire, Ace Combat 7’s VR missions utterly nail the feeling of flight. 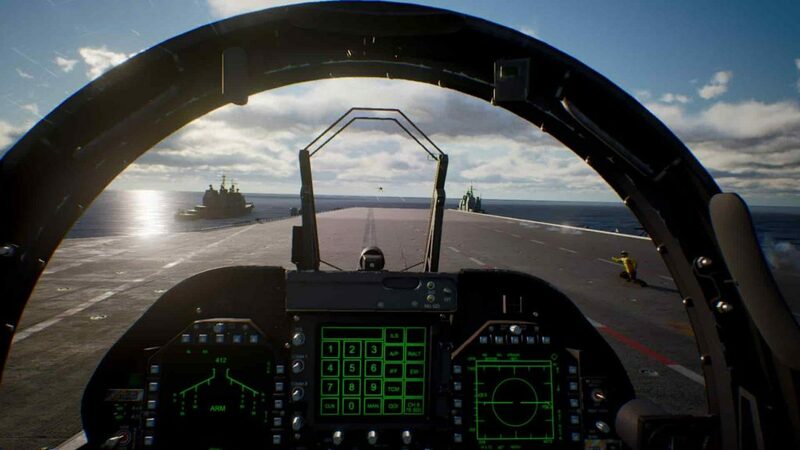 Crucially too, Ace Combat 7’s shift into PSVR does not compromise the game at all from a pure gameplay standpoint, as just about everything you can do in the main game can be done here – so while the offering of just three missions might seem trite, the actual mechanics remain delightfully familiar. There are fewer more poignant PSVR experiences than soaring above some snow-capped mountains at tremendous speed. On a purely technical level, these VR missions excel too. With great image quality across the board, not only do you get to see hugely detailed snow-capped mountain ranges, glittering oceans and fauna stuffed forests and fields, but there are the smaller details too, such as moisture and condensation building on your windscreen when you push through a cloud formation, for example. To say that the level of technical craft that has gone into the VR missions portion of Ace Combat 7 is substantial, would be something of an understatement. The quality of the sound engineering that has gone into the VR missions is notable too. From the sounds of the engine speeding up, to the whoosh of a missile narrowly missing you or the dull, metallic thud of an aircraft exploding at high altitude, it adds up to help make you feel like you’re actually in the pilot seat of a fighter jet and the experience is enhanced considerably as a result. Once the three missions have been beaten, there are a couple of extra modes on hand for players to get stuck into. Airshow mode has you stood on a carrier watching planes come, tailoring their maneuvers and aerial stunts as you see fit. Whereas the free flight mode simply does what it says on the tin – it lets you fly around and take in the gorgeous world of Ace Combat 7 in VR without the worry of enemy attack – fashioning what is a deeply relaxing side mode in the process. None of these extra modes are substantial of course, but as additional distractions they are welcome all the same. Ultimately, what those geniuses at Bandai Namco and Project Aces have accomplished with the PSVR portion of Ace Combat 7: Skies Unknown really is nothing short of remarkable. It’s just a shame that it ends all too quickly because much like the Star Wars Battlefront VR Mission before it, what has been wrought here feels like a prelude to a much larger, fully-fledged PSVR offering. And it’s one that I dearly hope to comes fruition. Developed and published by Bandai Namco, Ace Combat 7: Skies Unknown is available now on PS4, PC and Xbox One.